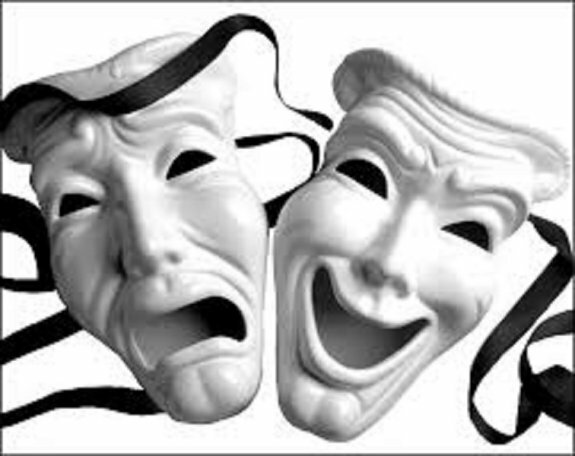 Acting can be seen in two different ways. First, acting is behaving. Behaving can be a matter of being ourself, if our self is inclined to be what is appropriate for the occasion. If our nature is to do what is inappropriate, or intended to convince someone we are other than we truly are, then acting is being a hypocrite, a phony. We're expected to say the same thing as everyone else in whatever gathering we find ourself. If we say anything other than the words expected by those around us, we're looked upon as something short of acceptable. Paul is instructing the church to be something, whether they feel like being that way or not. The Bible is a manual of instructions for us human beings who wish to please God, and who desire to function properly in this confusing world. Whereas Paul tells us to act like everyone else, Jesus says that if we behave ourself the same way most people behave, it will lead to destruction. Jesus goes so far as to say we're not to be a part of what we're doing or saying. He says we should just be a body through which the Holy Spirit can work. Paul said to do what everyone else is doing. I suspect he means to do what others are doing, if they are all doing what God says we're to do. Most people, those in churches as well as those in secular organizations, follow some form of traditions. The traditions they follow might be those they recently made up, but they still are expected to be followed. Jesus had to contend with those who were insistent on following man-made traditions, even when they conflicted with the laws of God which they claimed to be following. Here's where we run into a problem. The Pharisees of Jesus' day were doing just what is called for here. They saw Jesus as one who was preaching lies, causing division, and turning people away from the laws that Moses gave them. How can we know the difference? When we walk into a church, any church, we will be told that that church preaches the truth, and only the truth. They will tell us that we are a fool if we accept what some other church tells us. They will warn us against being deceived by false doctrine. What are we to do then, to insure hearing the truth, and avoid being a fool? We're told in the Bible that those who do not obey the laws of God, especially the Ten Commandments, will not be allowed into Heaven. However, I hear in some of the churches that this rule doesn't apply to those who have been baptized and attend the right church. We're told that truth is in the Bible, yet those who tell us to read the Bible to gain the truth, also tell us that what we read in the Bible does not apply to us. I haven't checked the newspaper yet today, but as far as I know, heaven and earth are still in operation. Wouldn't that mean then that the law is still in effect? It seems to me that there's a lot of teaching that either takes away from the Scriptures, or adds to it. Yet it appears to me that everyone who sits in the pew of any particular church fully accepts what they hear, and teaches what they hear, in spite of the fact that the Bible clearly teaches otherwise of what is being taught. I find it interesting how Jesus had to contend with people who fully claimed to follow the laws of Moses, yet have somehow missed this little piece of Scripture. Those people of God of olden times seem to have had the same problem as those of us living in the latter days. In the world we try to find in ourself the person we want to be (or should be), often represented by some media personalty, and we act like we are that person. We walk like that person, dress like that person, and talk like that person. This is a part of growing up, which is supported and assisted by the media. Our life is an act, as we attempt to discover who we really are, of if we truly are. In the churches it's the same way, so it seems. Everyone puts on their plastic, Sunday go-to-meeting face, and acts in a way that seems appropriate for the church they attend. Then when church is over, they take off their plastic mask, and once again become the person of the world they are at heart. We're careful to keep from having anyone deceive us, to turn us aside. But we don't need anyone to deceive us, we're perfectly capable of deceiving ourself. And while we're deceiving ourself, we're also convincing ourself that we are the only one with truth, and the only one sincerely honest with the world.